We ended a very successful Keeneland Fall Meet on Saturday with 3 winners. For the meet, our top selection won 37.27% of the time, but our top pick hit the board (first three slots) on 67.10%. And, our “KEY PLAYS” won nearly 55% of the time and hit the board in 18 of 22 starts. Not bad, statistically. 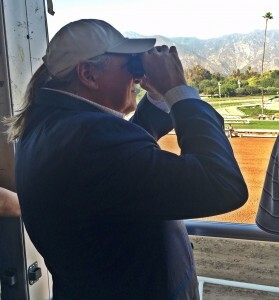 But we are looking for more this week, as we kick off Breeders’ Cup 2018. 1st: 7-5-1/6-3-4…Seaside Dancer (7) gets a slight edge in the lid lifter for us today. The 2YO Fed Biz filly was right in the mix in the debut run, before tiring against a couple of real good ones. The runner-up in that one has already come back to win, and the trainer hits with .17% of those making the second career start. Dam has produced .33% winners in the 2YO year. Lunar Orbit (5) is another who ran very well on debut before getting a bid tired late. Trainer does much better with second timers than on the debut. Rider chooses this one over our preferred pick, and the dam of this one has 1 winner from 1 starters. Nice work here on Oct. 23. Look for improvement. Shacklette (1) moves back up into the MSW ranks today after two nice runs for a tag. Gets the rail, and the trainer does score with .26% of those going from a route to a sprint and back to a route race. Watch out. I bet the 7-5 across the board and then box the top 3 in the exacta. 2nd: 4/2-1-5-7-6…My first Key Play of the new meet. Thousand Percent (4) is the even-money favorite in the ML and is likely to drop below that odds-on mark by PT. Ran super here in June to break the maiden and then wheeled back to nearly win the next out here in September. Barn scores with .26% of those returning to the races as a beaten favorite, and this one worked super here on Oct. 21. Definitely the one to beat. I bet the 4 to win/place and then key the 4 over/under the rest of the numbers listed in two exactas. 3rd: 8-4/1-7…I really like Cairo Cutie (8) in this event. This 2YO filly by Cairo Prince sold for $30,000 in June, and has been working very well for these connections since then. Love the work at Keeneland on Oct. 19, and gets an aggressive rider in the saddle for the debut today. Barn hits with .14% of those running for the first time, and that is with 85 accounted for. Beautiful Tale (4) ran a bit spotty on debut for the barn of Dallas Stewart. But the connections do much better with second time starters. Must be a “Lukas Student” thing. I bet the 8 to win/place/show and then box the top two numbers in the exacta. I will key the 8-4 over/under the 1-7 in two softer versions. 4th: 10-5/1-(11)-9/8-7-3/4-2…Full Swing (10) gets the nod for me in this one. The 2YO Verrazano filly will be getting the blinkers for the first time, and the barn is both red-hot overall and hits with .22% of those getting the shades for the first time. Has run three straight seconds to begin the career, and was beaten just a head over the soft ground at Keeneland in the last as the PT favorite. Barn hits with .24% of beaten favs, as well. Interesting rider choice for this barn. Julia’s Ready (5) ran a “better than it looks” fourth last time out at Churchill Downs in September. Nice closing move from off the pace in that one. This one will get blinkers for the first time, as well, and the barn hits with .21% of those getting the new equipment. Conditioner also scores with .25% of those routing for the first time. Love the breeding on this one. I bet the 10 to win/place/show and then box the 10-5 solidly in one exacta. I will key the 10-5 over the next three numbers in a smaller version. 5th: 4-8/5-1-7/3-10-2-6…Once again, I will focus on the top two numbers in the sequence — led by Liora (4). This one has run two nice races in the first two outs, and shows a nice “Z” pattern to the results. First time, started slow and rushed home. Second time, while going long on the grass, she showed speed and faltered late. Goes back to the dirt today, and the barn hits with .16% of these types of surface switchers. Barn also hits with .26% of second time routers. Great work here in the last a.m. prep. Looks ready. Still Here (8) ran well on debut at some nice odds for the barn of Brendan Walsh. This trainer rarely gets them cranked up for the first out, and does much better on second tries. Runner-up in the debut has already come back to win. Love the rider here. Doing very well right now. I bet the 4 to win/place/show and then box the 4-8 solidly in one exacta. I will key them over/under the 5-1-7 in two shorter versions. 6th: 7-10/9-1/3-4-5-8…My second Key Play(s) of the day comes right here with Proud Nation (7). And, with Frolic More (10). The former is a son of Tapit is a home bred for Gary and Mary West, and looked like a winner in the inaugural start at Ellis Park back in early September. Ran the feet off Mr. Ankney in that one, and edged Mr. Money for second. Both of those are truly nice 2YOs. If he can duplicate that effort today, and the recent works suggest that he is sitting on go, then he looks mighty tough in this spot today. He would be a single if not for the presence of Frolic More (10). This one should have won last time out. For sure. Terrible start. Came running with a furry to get nipped a head at the wire. A true running machine. I bet the 7-10 to win/place and then box the 7-10 strong. 7th: 5-6/9-(13)-10-8-(11)-2/4-(12)-7-1…I have dotted this sequence with some from the AE List. If they draw in, they should be given some consideration. But I am solid on my top three picks, for me, led by Shychief (5). This son of More Than Ready ran in the G1 Summer Stakes at Woodbine in the last out. Made a nice move, but the extreme wide trip took its’ toll late. Gets a huge, huge rider switch today to a hot jock. This one has faced some real tough ones of late, and should relish this grass course. Love the work at Keeneland on Oct. 17. Looks sharp to me. Afleet (spell check on that is a naughty word) Moment (6) comes from the Mark Casse barn and will move to the grass after a run over sloppy ground in the debut effort. Didn’t care for that surface at all, when well supported at the windows. The dam of this one was a Stakes winner, and has throw a grass winner already — with 5 winners from 8 starters. Should love the switch in surfaces today for a barn that hits with .12% of those getting the sod for the first time. I bet the 5 to win/place/show and then box the top 2 in one exacta. I will key the 5 over/under the 9-(13)-10-8-(11) in two smaller versions, as well. 8th: 2/9-4-6/7-8/5-3…Rags to Riches Stakes ..My third Key Play of the Day comes here with Mother Mother (2). This daughter of Pioneer of the Nile was once considered a top candidate for the Breeders’ Cup Juvenile from the barn of Bob Baffert. She won her debut race at Del Mar by more than 6 commanding lengths. Came back to run second against the undefeated Bellafina — who is likely to be one of the top choices for the Juvenile on Friday. This one is training lights out and will be well supported at the windows. Choice or riders is interesting. (Remember the Belmont Stakes?) I bet the 2 to win/place and then key the 2 over/under the 9-4-6 in the exacta. I will key the 2 over (only) the 7-8 in a smaller version. 9th: 12-7/6-(13)-4-3-1/9-5-2…Limonite (12) is 10-1 in the ML and I would love to lock in those odds. If anything close to that, he will be my Upset Special of the Day. Ran a huge one on debut at Saratoga to lose by only a neck to Signalman — who will be running in the BC Juvenile on Friday. Came back to break the maiden at Keeneland going 7 furlongs — which is one of the toughest distances at that track. Came from well, well, well off the pace in Lexington to win — and speed was carrying there the entire meet. Now, gets to stretch out for the first time. Barn does well in that move. I go strong here. Jais’s Solitude (7) is also 10-1 in the ML, but I love the race history on this one, too. Won easily in the debut over the sod at Indy Grand. Came back to face Henley’s Joy — a SW already. In first try on the dirt, he caught Manny Wah — a real good one. Could be tough off a solid work in the a.m. I bet the 12-7 across the board and then box those two solidly in one exacta. I will key the 12-7 over/under the 6-(13)-4-3-1 in two more smaller exactas. I will use the 12 over (only) the 9-5-2. 10th: 5-8-3/9-6-1/4-2…Spendthrift Juvenile Stakes…An innovative way to support and promote the farm’s top Stallions, and this one has turned out to be a good one. I will give a slight edge to B.B. Dude (5) — who comes from the barn of Steve Asmussen. (He could have a really good day today). This son of Shakin It Up won here on debut in June. Beat a nice one in Carter Cat that day, and then took his game on the road. Won a Stakes in New Mexico and in Oklahoma. Now, he is back to where it all began. Working well, too. Watch out. Into the South (8) is 6-1 in the ML and worth a shot here. Ran fourth in the G3 Matron Stakes on the grass at Belmont Park in the last out. Now, gets back to the dirt — where I think she belongs. Ran two seconds and a first in three tries over that surface. Look out for this one. Gentle Warrior (3) is 10-1 odds and should really improve with the addition of Lasix today. I include. And, I will also use Naughty Joker (9). Trainer hits with .30% of those moving from the sod to the dirt. Great work at Keeneland in last morning prep. I bet the 5-8 across the board and then box the 5-8-3 in one exacta, and the 5-8-9 in another. 11th: 3/10-8-2/1A-7-4/6-5-9…My last Key Play of the Day comes in the finale. Harvey Wallbanger (3) nearly won the last time out, and I touted him that day as a KEY PLAY. Lost by a stinking nose as the favorite. Now, he gets back with the Lasix for the second time and goes a route for the second time. Should be better all around. This one ran second to Complexity — who will be a huge favorite in the Breeders’ Cup Juvenile on Friday. I will try again. I bet the 3 to win/place and key the 3 over/under the 10-8-2. I will key the 3 over (only) the rest of the numbers in a much smaller version.